Today I was able to go out and do a site visit with the Red Feather Crew on the Lions Gulch Trail just outside of Estes Park along CO 36. 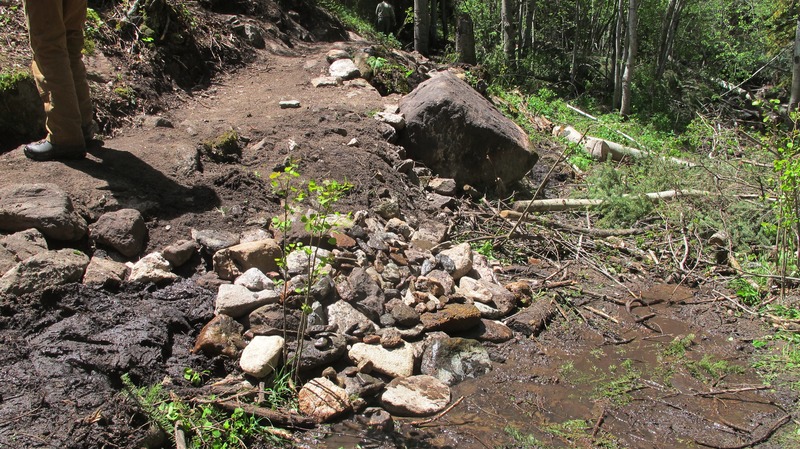 The trail is currently closed due to significant flood damage. 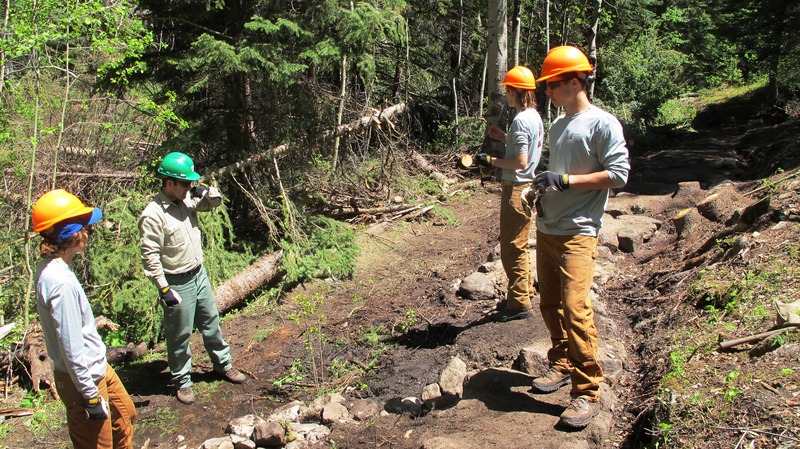 So, Rocky Mountain Conservancy – Conservation Corps Red Feather Crew was on the trail completing trail restoration work today with the USDA Forest Service, Larimer County Conservation Corps, and NEPA crews. When I arrived onsite after navigating my way through the damaged sections and missing river crossings, I discovered one of the USDA Forest Service staff working with Red Feather worked on our Estes Crew in 2006, and he in credits his experience with the Rocky Mountain Conservancy for his position with the Arapaho-Roosevelt National Forest. Nonetheless, the crew was hard at work when I arrived. 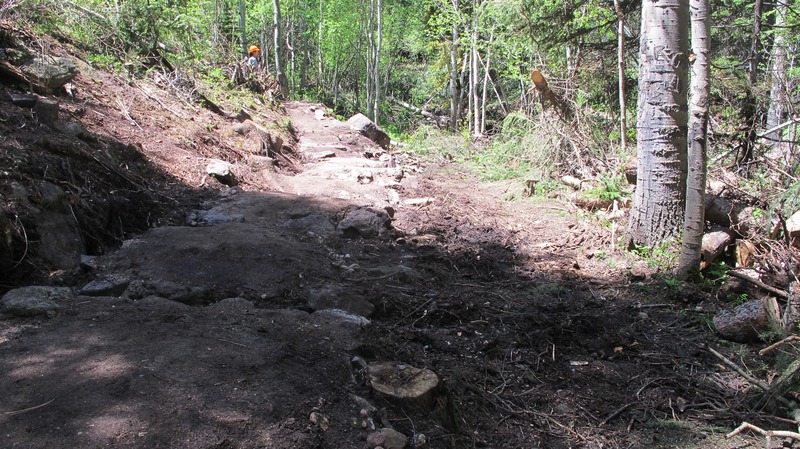 Clint, Jay, and Mary were busy building drainages and repairing rutted trail tread. 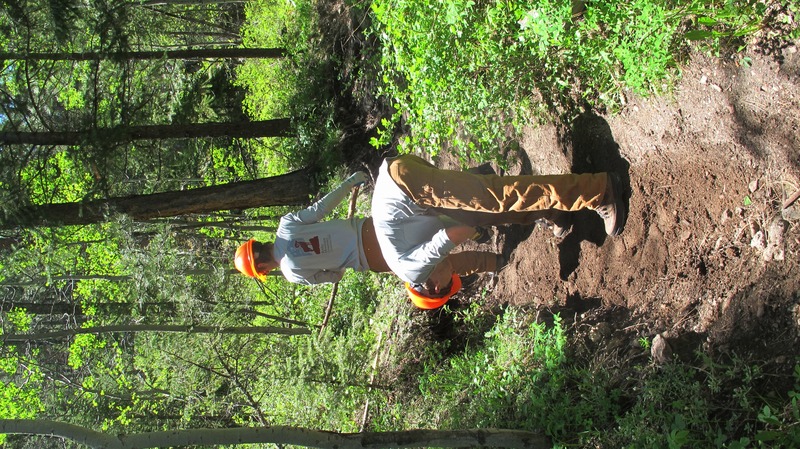 Mary digging a drainage to divert water off the trail. Clint and Jay resurfacing rutted trail tread. A series of newly installed drainages and a section of newly resurfaced tread by Red Feather Crew. The rest of the crew was just up-trail working on a turnpike. A turnpike helps people navigate through wet areas without damaging the sensitive ecosystem by raising the trail tread above the ground on top of rock fill. Rebecca, Joe, and Michaela were helping complete this project by clearing the brush along the turnpike and building a horse ramp to allow horses to pass through the area as well. Rebecca, Joe, and Michaela discussing the use of the horse ramp and needs for completing it with USDA Forest Service Supervisor. Completed horse ramp structure before creating the tread. 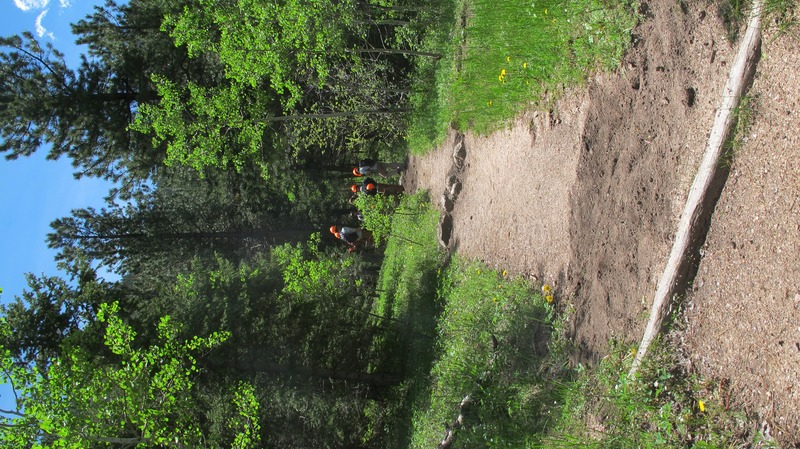 After I left, the crews were headed further up the trail to create trail tread on a rerouted section. “Red Feather’s inaugural week in the field began Saturday afternoon (May 24th) when the crew invaded Fort Collins’ “Old Town” in hopes of learning a little about where we’d be living this summer. Highlights from the afternoon included an extended visit to a quaint local used bookstore as well as a dinner at a BBQ joint. With Jay and Clint both having lived in Fort Collins for school, some of us were used to such a backdrop. Still, the city was a bit of a change for some. Joe, hardly an urban fellow, was a little rattled when a strange old man suddenly approached and asked for his phone number. Luckily Rebecca had his back or God knows what would’ve happened to the kid. Sunday began bright and early with a leisurely day hike over at Lower Dad Gulch. The weather was hot and humid early on, but soon changed to pouring rain by the afternoon. Red Feather was ready, however, with Clint and Rebecca having wisely advised us to pack rain gear beforehand. All in all it was a great time and an enjoyable way for crewmembers and leaders to become acquainted. Memorial Day was very low key in the Forest Service bunkhouse, with many of us just trying to catch up on rest before the real work began on Tuesday. We took the time to get to know some of the Forest Service employees who shared our bunkhouse. They were welcoming and continue to be friendly toward their younger housemates. The first day of work started unnecessarily early for some as we set our alarms the night before to make sure we’d have time to complete all of the morning’s tasks. After making lunches and securing our packs, we headed out to the tool shed to await the arrival of our fearless leader. Though simply known to us as “Fred,” the man’s character proved to be more complex than his name could ever imply. He is perhaps best described as the smooth blend of lumberjack and philosopher. Though rugged by trade, Fred is strangely refined and perceptive. He would have us rolling with laughter while maintaining a genuinely stoic countenance. It wasn’t humor, just him speaking the truth. However entertained we may have been by Fred, it was still our job to learn from him, and learn we did. 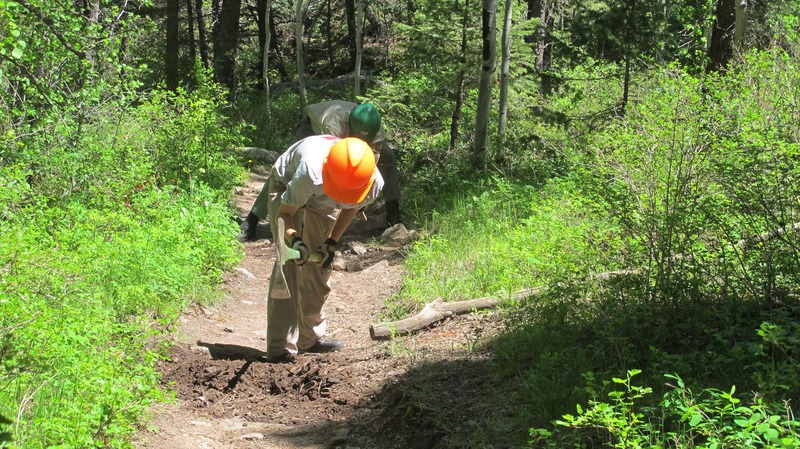 Day one consisted of an introductory lesson on the basics of trail work, which we did in conjunction with the Rawah Crew. This was particularly helpful to the uninitiated, who worked firsthand to control water flow in the trails and streams, constructing a large earthen dam that was successful in alleviating moisture on the nearby tread. It was a lot of fun working the trail with Fred, who was always there to offer advice and pitch in when needed. Red Feather and Rawah underwent saw training on Wednesday and Thursday, driving out to various regions with Fred to learn and refine critical skills. Using crosscut and corona saws as well as various other sharp metal objects, hundreds of already dead trees were further destroyed in the name of education. 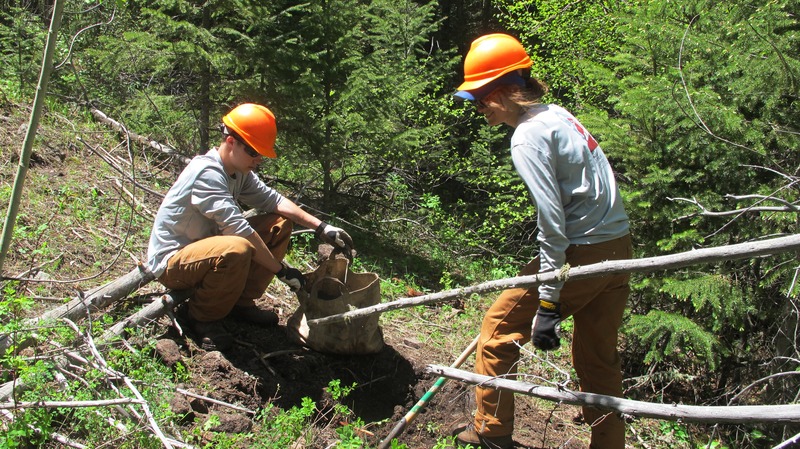 Fred supplemented our hands-on training with far-fetched anecdotes pulled from his nearly twenty years with the Forest Service. We would come across large messes of tress, and Fred would give us hypothical situations where we’d have to clear paths using the tools we had. By Thursday afternoon Red Feather and Rawah had cut a forest of already dead trees and were ready to work independently. We reluctantly said good-bye to Fred, who promised to visit our work sites on what we knew would be an unpredictable basis. Red Feather awoke early Friday morning self-confident and just aching to work the trail alone for the first time. Full of fervor and enthusiasm, we made the long drive out to someplaceImnotsurewhere and were met by…rain. It poured from noon on to the end of the workday. Our rain gear weighed down heavy from the saturation and our boots sank deep into the foul-smelling muck. It was far from ideal, but Red Feather’s spirit refused to be broken. We ended up applying our new saw skills right away after coming across two large downed trees. The crew cleared them in no time. From there we split up into two groups to maximize our effectiveness and cover the most ground. Many a tree was trimmed, no doubt saving hundreds of unassuming hikers from debilitating and certainly mortal injuries. We did what we could. The first week took a lot out of us, but I’ll be damned if we didn’t put a lot of work in. We resume work on Monday after the short weekend. I think things have gone great thus far, and I look forward to next week. A bunch of us watched The Shining one night during the week and determined that it is not scary at all. Y’all are wimps. As a crew, Red Feather has set out to try all the BBQ places in town so we can write volumes about which is best.